Did you catch the news? We are officially awaiting baby number three, and with that comes all the more need for planning out our weeks. While it is what it is now, I know that the recipes we get in the routine of trying are going to become all the more apart of our routine when I start planning for our next child's arrival in August! You are going to start seeing some repetition of recipe ideas as we move into almost the third month of meal plans. 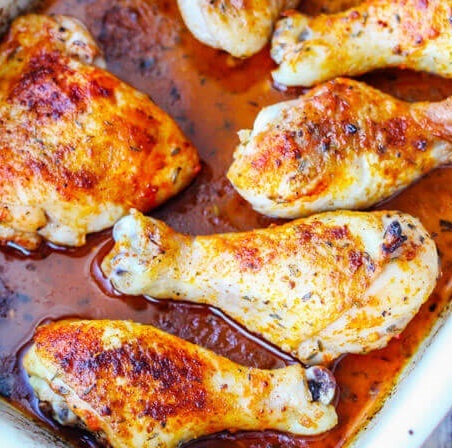 That’s because while I love trying out new recipes, what I love even more are finding tried and true classics that are ones I get used to making effortlessly and feel confident offering my family. This helps minimize decision overload with ALL the recipes out there, and it helps me establish patterns for what recipes we love the most each season. This is also a part of my “nesting process” to streamline which meals are going to be making our perpetual menus post-partum! I am going to take a minute to highlight a bit more of a sensitive subject in light of Eating Disorder Awareness Week next week. As parents, we hear a lot of obesity prevention in kids. On the flip side, we also constantly worry about if our kids are getting "enough" in these early years when apprehensive eating tends to be at its peak. Amidst these concerns here and now and potentially to come, we often lose sight of another real threat: eating disorders. Little do we realize that how we talk about food, treat food, and role model our relationships with food affects our children. But it does. Oh moms, hear me out. It does. As intuitive eating and a model for the Division of Responsibility become more well-known, it is important to address WHY these even matter to us as parents. As a dietetic student, many dietitians such as myself were trained to understand weight and calories as two of the most basic indicators for one's health and nutritional status. As a parent and practitioner now though, I know there is so much more to the puzzle of one's wellness beyond just how much (or little) they eat and how big (or small) they are. It is complex and thus, requires us to take an even more conscious look at how to raise truly healthy children (and someday, adults). We as parents must take caution to the real concern that faces our children amidst not only an obesity epidemic, but also with the opposite of a growing number of eating disorders in adolescents. We need to recognize that the threats for body dissatisfaction, disordered eating, and unhealthy relationships towards food start young. Thankfully, we have the opportunity to change this though by paying attention early to what is proven as the most effective approach to raising healthy children (the Division of Responsibility). By raising our kids in a feeding environment that practices many of the approaches I share here each week in the "PAIR" section, we begin to put in place for them a norm that honors intuitive eating behaviors, body acceptance, and overall better health. We empower our kids at a young age to trust their intrinsic cues for hunger and respect their feelings of fullness. By not over-riding these innate skills from an early age, research shows us that we can set our children up for success in their own health, while also helping to protect them from years and years of issues with disordered eating. I am not the I-don’t-eat-carbs-at-breakfast-type. As a matter of fact, as a human I am a big BIG fan of all the starchy goodness to start off my day. What I don’t like as a dietitian mom, however, is the blood crash that can happen in both my kids and myself after a more refined breakfast meal like traditional pancakes with syrup. That’s why I am mindful about what mixes I use, recipes I make, and toppings I offer. I know that in order to sustain energy in both my kids and myself, we need a combination of protein, fat, AND carbs to keep us going in the AM. What many parents miss however is either offering a straight starchy option (think traditional pancakes and syrup) or going to the other extreme and becoming overly concerned about there not being enough protein in the meal for their preschooler. That’s why I want to highlight the happy medium here. There are some awesome homemade pancake recipes out there that when I have time, I love to use. I almost always have ready-to-make pancake mix on hand though as I like it for busy mornings and because it is one of the go to meals my husband knows how to “make" for breakfast if I am out running or getting that glorious chance to sleep in. Add some protein and fat: It is a good idea to use milk or a milk-alternative in place of water for a nutritional-boost with premade pancake mixes. You can also find paleo blends that have almond and/or coconut flour as an alternative to grains for the flour. These add fat and/or protein to your pancakes to help stabilize energy levels and satiety for longer. I wouldn’t suggest pancake powders with added protein powder though necessarily, as those offer more protein than your child likely already needs. For more info on HOW MUCH PROTEIN their child actually needs, visit this article. Top smart: We do own and use pure maple syrup in my house. That said, I try to limit it’s frequency so they aren’t bathing their pancakes in a bath of it each time we have pancakes. Instead, offer homemade berry chia jam, fresh whipped cream, or nut butter with bananas and a drizzle of honey for some other yummy and yet lower-sugar options. So what kind of pancake mix do we buy? Well, my husband does love the Power Cakes from Kodiak Cakes, and my girls sometimes eat these as well. 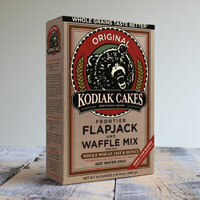 However, as our norm, I prefer to buy other varieties of Kodiak Cakes that are whole grain without the added protein powder (like this one; affiliate link). For a gluten-free pancake, I almost always end up making the mix from scratch. For a store bought option though, I love these ones from Whole Note (affiliate link). Thaw chicken. Cut up cauliflower and sweet potatoes, or skip this step and buy the ones already washed and diced in the produce section at Trader Joe's or most major grocers. If prepping the night this is cooked, go ahead and add marinade to the chicken. Make spinach pesto. Chop vegetables for later roasting and store in an air-tight pyrex until the time of cooking. May also roast a day in advance, if you already have the oven on for Sunday night's dinner. Make sure to thaw shrimp and have it cleaned, if not purchased this way. Can go ahead and prepare the sauce in advance and store in a mason jar; reheating and adding shrimp on the night it is to be prepared. Prepare spaghetti sauce in advance, when already in the kitchen chopping vegetables and with the stove going with other things. Store in a glass container and reheat the night of this meal being served. Shred cheese for topping. May cook bacon in advance, 3-5 days, and store in an air-tight container. Otherwise, wait to dice potatoes and other ingredients until closer to Saturday or whichever day you plan to serve this meal.